Despite being the most reliable accounting software, QuickBooks can also be a troubled victim. In this article, we will discuss how QuickBooks support team can help you fix damaged file data in QuickBooks. Data damage tops the list of the issue that a QuickBooks user faces. Hereby, QuickBooks Support provides you some steps which you can follow to resolve data damage issue on your company file. 1. In the file menu, go to utilities and then select Rebuild Data. 2. Click on OK on the QuickBooks information window. Go along with the prompts to save the backup. Wait for the rebuild to finish. Rebuild continues as long as you see the cursor move. 3. Click OK once you see rebuild complete message prompting on screen. After rebuild data utility process is completed, the user needs to verify data utility. Given below is the process to run Verify Data Utility. 1. In the file menu, go to utilities and select verify data. 2. If the screen displays QuickBooks detected no problem with your data, click OK. It means that your company file is good to go and you can continue using your company file. 1. Go to the product information window and select review last verify/rebuild. 2. You will find the error in the result screen. Note: Perform the steps below only if you are good at working with QBWin.log or the Quickbooks.log file. 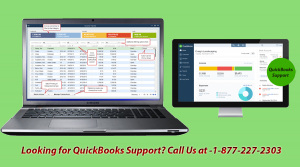 If you are not comfortable working with log files, feel free to Contact QuickBooks Support at 1 ( 877 ) 227 2303 for more help. 1. Look for QBWin.log or quickbooks.log files on your system. You can put your records back in order by performing resorting of lists. Re-sorting will undo all the changes that have been done manually on the lists. 2. Go to options and choose either accrual or cash for the report basis. If you do not find equity among the assets and the liability report, determine the transaction causing issue, delete and re-enter the transaction by first taking the backup of the company file. 1. The user needs to compare the total in the Open Invoices report (Reports menu, Customers & Receivables, Open Invoices) to the Chart of Accounts Balance. 2. Then Compare the total in the Unpaid Bills report (Reports menu, Vendors & Payables, then Unpaid Bills Detail) to the Accounts Payable balance on the Chart of Accounts. If the total does not match the balance determine the transaction causing issue, delete and re-enter the transaction by first taking the backup of the company file Perform Specific Accounts Check. While performing the rebuild, it may sometimes put out-of-balance transactions in the account in order to make the transaction “balanced”. Generally, this account shows you voided checks. The voided check may be any transaction with an amount that does not have any item name or account associated with it. Look for the voided checks transactions. You need to determine the item and account on the transaction and simply delete and re-enter those transactions. The deposit total amount should be equal to the balance on the chart of accounts for undeposited funds. Make sure, it does not display any negative amount on the deposit. 1. From the lists menu, select Chart of Accounts. 2. Press the control key and along with the damaged account. Choose edit account. 3. Add an asterisk (*) to the damaged account name and select Cancel. 4. Select any account holding the control key. 5. Choose a New Account. 6. Select the appropriate type, and then enter the original name of the account that had a problem. 8. Select the original account holding the control key. Choose Edit Account. 9. Remove the asterisk (*) from the account name. Select OK.
10. Click OK to confirm merging the two accounts. 2. Select the damaged item while holding the Control key. Click Edit Item. 3. Add an asterisk (*) to the name of the item, and then click Cancel. 4. Now again select an item holding the Control key. 6. Choose the appropriate type, and then enter the original name of the item that has the problem. 8. Select the original item while holding the control key. Select Edit Item. 9. Remove the asterisk (*) from the item name. Click OK.
10. Click yes to confirm merging of two items. 1. The user needs to Open the appropriate Center to choose the type of the name to merge (Customer, Vendor, or Employee) for the type of name you are merging. 2. Select the damaged name while holding the control key and select Edit. 3. Edit the name by Adding an asterisk (*) to the name, then Choose Cancel. 4. Select any name holding the control key. 6. Choose the appropriate type, and then enter the original name. 8. Select the original name holding the control key and select edit. 9. Edit the original name by Removing the asterisk (*) from the name and Click OK.
10. Click yes to confirm merging of two names. Eradicate memorized reports or transactions. 2. Select the name of the report once which you want to delete. 3. Select the red X and hit ok, this will delete the memorized report. 1. In the list menu, select memorized transactions. 2. Choose the transaction to be deleted. 3. Go to edit menu >delete memorized transaction.